Where can you get a beautiful dental crown in Erlanger in just one appointment? Go to Independence Family Dentistry and Danny Nakula DDS, your restorative dentist in Erlanger. Of course, you may have questions about these all-porcelain restorations and how they are individually crafted in just about one hour right in the treatment room. So, here are answers to some frequently asked questions posed to Dr. Nakula and his team. They want you to be fully informed about your oral health and the modern restorative treatments they offer. A dental crown–also called a “cap”–is a restoration which covers and supports healthy tooth structure remaining after root canal therapy, extensive decay, dental abscess or oral injury (fracture). It also remodels a tooth that is misshapen through congenital defect or may be used to finish today’s most effective tooth replacement option, the dental implant. Also, crowns support fixed bridgework (one or more artificial teeth in a row). Traditionally, dental crowns were composed of gold or other precious metal, porcelain fused to metal or all-porcelain. 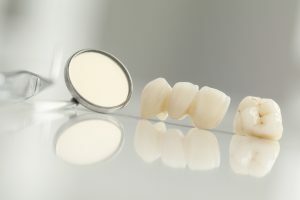 Dr. Nakula and his team highly recommend all-porcelain for almost all their crown applications because of its natural-looking beauty and durability. How Does the Dentist Evaluate a Patient for a Crown? Dr. Nakula performs a comprehensive oral examination and digital x-rays to confirm the need for a crown. Then, using sophisticated CEREC technology, he takes a digital impression. CEREC means CEramic REconstruction. How Long Does the Crown Process Take? Including preparing the tooth to receive the dental crown, taking the digital impression, designing the restoration with digital design software and milling the crown, the process takes just about one hour. An amazing chairside milling machine actually carves the crown from a solid block of porcelain in about 15 to 20 minutes. Then, the doctor performs some final shading and shaping and bonds the crown to the prepared tooth. Yes, they are very durable and long-lasting. With good brushing and flossing at home and in-office cleanings and check-ups at Independence Family Dentistry, the new crown should last for ten years or even more. Are Crowns Really Worth the Investment? Plainly put, dental crowns save teeth. Your dentist wants you to keep as many of your natural teeth as possible, avoiding the chewing and biting problems, jaw and gum recession and weakening of adjacent teeth which occur with tooth loss. Plus, Dr. Nakula’s crowns look so natural, patients enjoy a real boost in smile aesthetics. The team at Independence Family Dentistry will help you decide if a dental crown is right for your smile. Please contact them to arrange a restorative dentistry consultation.